Summer Amphitheatre: art in art. This attraction of Vitebsk is recognizable not only in Belarus but also far beyond its borders. In fact the Summer Amphitheatre hosts festivals and competitions of international importance, which is closely monitored both in the CIS and in Europe. So even if you visit the city for the first time, you will not have to wonder what to see in Vitebsk. If you want to see a miracle, it is not necessary to travel so far from home. If you live in Vitebsk, you can say you're lucky. If not, hurry up in this wonderful city to get acquainted with the unique monument of modern architecture – you will not find anything like that in Europe. Who has not guessed yet, I'll explain: we are talking about the Summer Amphitheatre. Today, it is not only a centre of the cultural life of the city, but also an outstanding architectural monument of Vitebsk. In the history of Vitebsk 1987 did not pass without trace – just then appeared an idea to build an open concert venue, which is not only a worthy monument of architecture of Vitebsk, but has become unique in the world. Not getting a jump on the idea, architect V.Babashkin started developing the project. 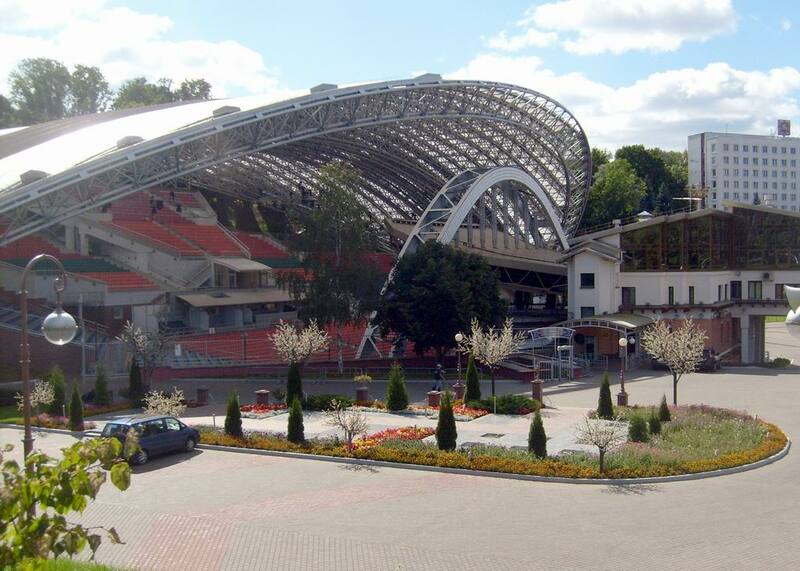 It was to build the Summer Amphitheatre in the center, so that everyone can feel the heartbeat of modern Vitebsk. And the chose location disposed to creativity and inspiration: the concert venue was built in the ravine of the stream, which slopes came to defend the mysteries of music, protecting and shielding its wonderful notes from the city noise and fuss. It was just six months enough to bring the started matter to an end. The Summer Amphitheater with capacity of 5400 seats became the decoration of the urban development and the indisputable attraction of Vitebsk. And in 1988 this was the first concert. By the way, the place where the Summer Amphitheater was built, has a long theatrical tradition. That`s why here not only every corner, but even the murmur of the brook is impregnated by breathing art. The thing is that Larry circus presented its smart shows here more than a century ago. Time passed, Vitebsk grew rapidly, with each day becoming more and more solemn and attractive. And the Summer Amphitheatre did not stay aloof from the conversion. 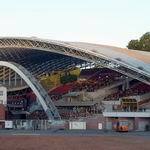 As a result of upgrade in 1999 the appearance of the ground has changed: plastic chairs appeared instead of wooden ones, a middle tier in the audience rose three meters high. The innovations also included a guest lodge for 15 people, and the third floor added specifically for artists. 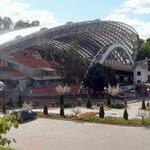 Since the amphitheater has become even more attractive to other tourist facilities in Vitebsk. In less than two years it became necessary to carry out the next upgrade: the outstanding object of the culture of Vitebsk, as it turned out, had no dressing room. Therefore, in 2001 built one more floor with a comfortable environment for artists was built up. But in 2006, again, it was planned another reconstruction: modern Vitebsk needed at least a modern and stylish concert hall, which would not only smoothly fit into the surrounding landscape, but also become an elegant highlight of the city. This time it was the most tremendous upgrade of the Summer Amphitheatre. The reconstruction project was carried out by outstanding Belarusian specialists under the guidance of architect A.Zafataev. 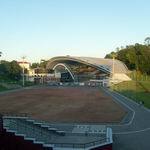 They had two tasks: to increase the number of seats and to build a roof over the audience space. The plan was implemented in July 2007. Then, openwork of the Summer Amphitheatre towered in the centre of tourist Vitebsk made of metal that would hold 6200 spectators. The connoisseurs of art and architecture faced updated concert hall in all its. In the Summer Amphitheatre, there appeared two large screens, comfortable and convenient dressing rooms for performers and special rooms for staff. New light and sound equipment was purchased. Leading companies in Europe and the U.S. were engaged in its design specifically for the Summer Amphitheatre. As a result of hard work and talent, combined with the advanced achievements of technological progress the amphitheater sounded loudly illuminated by hundreds of lights. Clearing up, the Summer Amphitheater basically has three component parts and is an integral part of the architecture of Vitebsk. First, the tribunes, part of which is located on the slope of the ravine. Second, an artistic four-storey block with the scene, whose area is 430 m². In case of bad weather the artists are protected by the shield supported by a 54-meter steel arc. 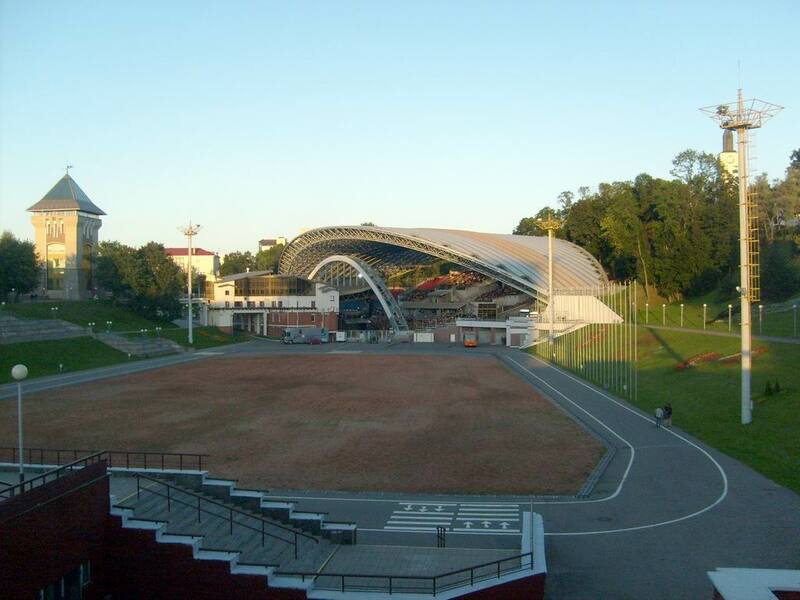 Third, special attention should be paid to the roof over the tribunes. A 120-meter high arch frame, though a delicate spider's web, towered above the ground at 25 meters and as if frozen, watching the unprecedented beauty of Vitebsk. The construction of the flooring took 18000 metal cores. Their fixing took about 3000 metal balls. The reliability of structures cannot be doubted: the roof has successfully bore the test load equivalent to 700 tons. Undoubtedly, the Summer Amphitheater is the desirable place to appear for both starting pop stars, and for recognizable performers in the world. The thing is that the events developing on this scene are followed by the whole world. And once having appeared in the Summer Amphitheatre, the artists` names fall not only on the pages of the history of Vitebsk, they become recognizable in the world. In continuation of Vitebsk tour you can visit no less interesting objects of art and culture, which are located far from the Summer Amphitheatre. They have long been included in the list of priceless cultural heritage of Vitebsk. Among them, the Museum "Dukhovskoi Kruglik" and Art Museum, the building of the shopping centre "Marco City". Unforgettable emotions, calm and joy could be got during a leisurely stroll in Frunze Park. For more detailed information please visit VitebskCity.by. Address of the Summer Amphitheatre: 13a Frunze ave, Vitebsk.